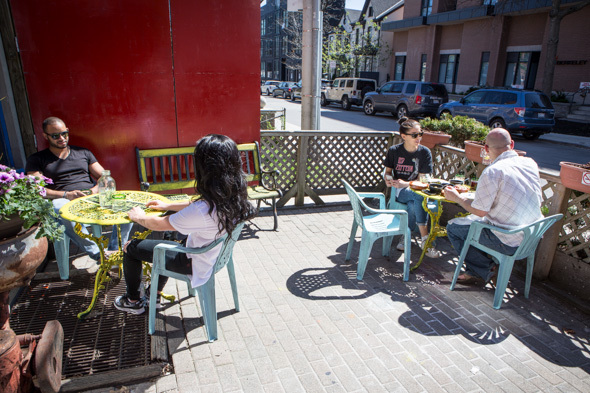 Cocina Economica in Corktown is the sixth member, and one of the smallest, of owner and chef Dave Sidhu's Playa Cabana family of restaurants. 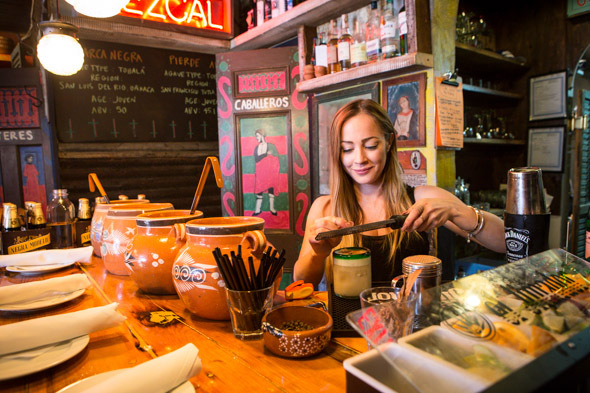 The space has totally been transformed from its days as the Berkeley Cafe into an aesthetically pleasing tribute to homestyle Mexican cooking, with a tortilla press, molcajetes and clay cookware as part of its rustic decor. Around 34 diners can be accommodated inside on the ground floor, at about eight tables plus some seats at the bar. A front patio fits a very tight 20, and a second floor with a back patio are still to come. Colourful woven table runners, talavera tiles and hand-blown glasses, all sourced and brought over from Mexico, add to the overall traditional ambiance of the place. Pre-made cocktails like sangria and Dave's Margarita sit in ceramic jars called ollas ($7-12/glass, $35-60/pitcher), ready to be ladled out and served. There are also aguas frescas ($3/glass, $13.50/pitcher), my personal non-alcoholic Mexican drinks of choice, with horchata (dairy-free rice milk and cinnamon), jamaica (hibiscus flowers, and unlike the country, it's pronounced "ha-mike-ah") and tamarindo (tamarind) available here. 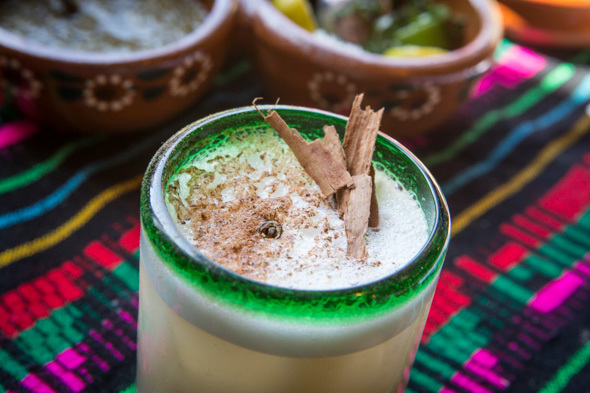 Or, you can get the best of both worlds with an alcoholic agua fresca . A special cocktail called the Horchata Margarita ($12), which combines horchata with Casamigos (George Clooney's label) tequila blanco, lime juice and cafe de olla syrup topped with cinnamon and shaved all-spice berries, is a frothy delight. 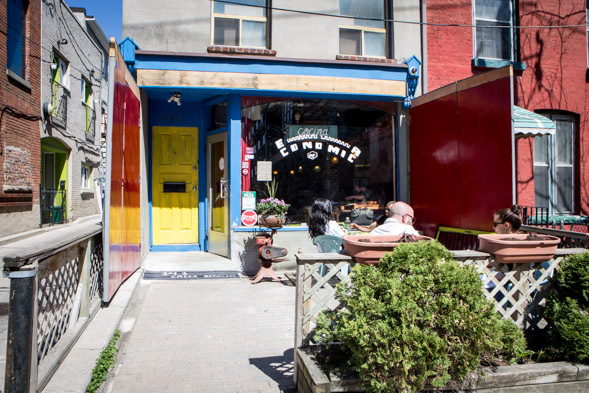 The joint has aspirations to be Toronto's first mezcaleria, moving beyond tequila (a very specific mezcal) and featuring hard-to-find mezcals Sidhu has acquired on consignment. There are currently over 20 different bottles to sample. Helping Sidhu in the kitchen is chef de cuisine Samantha Valdivia, who's originally from Cancun. 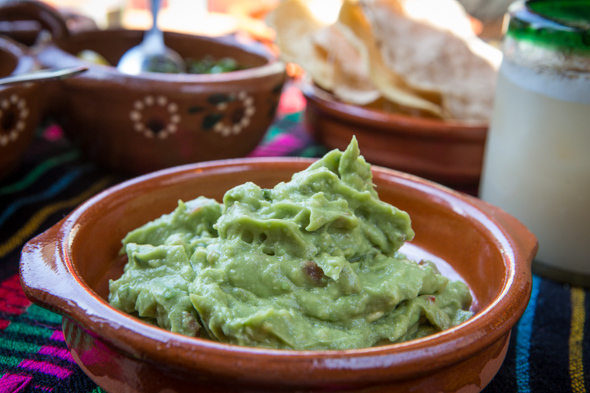 While munching on fried tostadas and salsas (one red, one green, neither very spicy) along with slightly healthier, baked tostadas and guacamole, I realize they really are trying to run the place like a cocina economica . 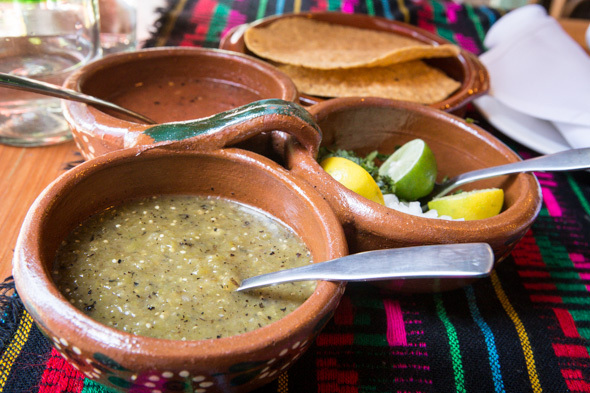 In addition to slow-cooked meats sold by the pound and half-pound on the menu, there appear to be improvised off-menu dishes and comida corrida (cheap, daily set meal specials) based on the whims of the cooks and whatever's available. When we visit, carne asada tacos (two for $10) are on offer. 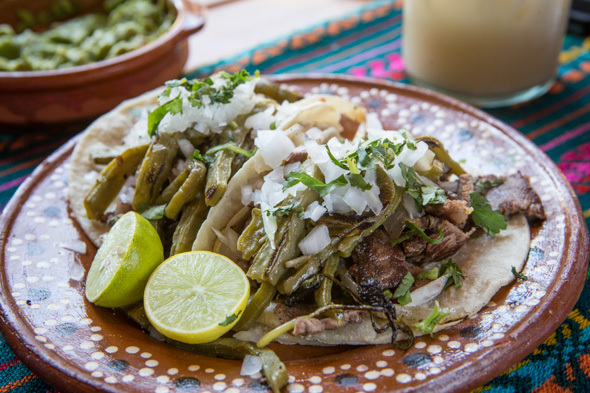 Thinly sliced steak is cooked on a plancha (flat-top grill), giving them a nice bit of crispy char flavour, and then they're topped with nopales (cactus), arbol chilies, onions and cilantro. I'm happy to see they double up the tortillas here, which is how they did it at most taquerias I visited for the two years I lived in Mexico. It's a good way to ensure that the structure doesn't fall apart on you while eating. I'm told a caldo y torta (soup and sandwich) deal for $12 includes a daily soup or consomme as well as a Portuguese bun stuffed with one of the slow-cooked meats. It'll be exciting to see what other on-the-fly items they come up with. All the by-the-pound entrees are meant to be eaten family style, and are served with Mexican rice and beans, onions, cilantro, adorable little Mexican limes, and fresh tortillas wrapped in cloth. The meats are cooked with bones in, because duh - bones add way more flavour - so just watch out for them when you eat. Vegetarians have the option of a vegetarian chorizo made of soy ($14 for a half-pound/$28 for one pound) that's served in a cactus and chayote hash (and obviously don't have to worry about bones). 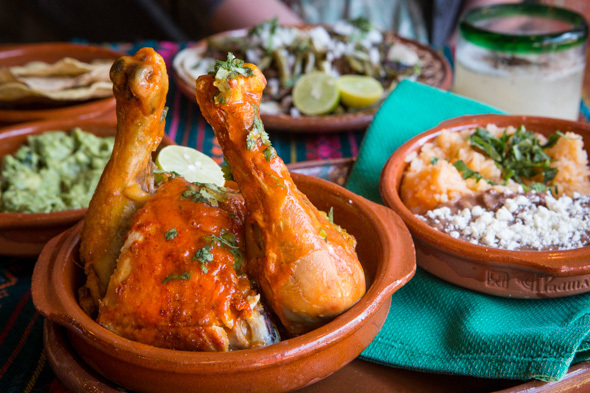 Pollo rostizado ($14/$28) arrives as moist and succulent oven-roasted chicken leg quarters in a sweet and tart adobo sauce that also has a bit of zing to it. It's actually kind of fun to decide how you want to eat it: you can mix and match separate bites of everything or just put it all together and build your own tacos. What really brings back memories and flavours of Mexico for me is the lamb barbacoa accompanied by a lamb consomme ($18/$36). 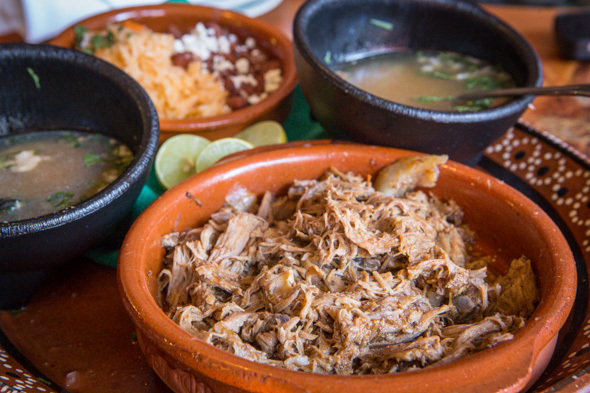 Even though the small kitchen (it's half the size of the dining room) has creatively modified the way the lamb is cooked - here they trap in all the steam using molcajetes - the end result is still a tasty and tender lamb version of pulled pork. The half-pound could easily fill up two people. 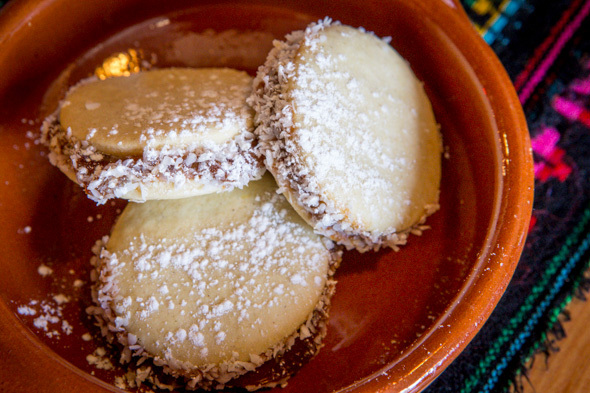 For dessert, there are alfajores (3 for $11), with hand-churned dulce de leche sandwiched between homemade corn flour cookies rolled in shredded coconut and dusted with powdered sugar. They're light and crisp to bite into, with a bit of added crunch from the coconut, and not too sweet to boot. I have to say my all-time fave Mexican dessert though is the tres leches cake ($8) topped with fresh whipped cream, and they make a good one here. I think this may be my favourite of all the Playa Cabanas I've visited so far; it's unpretentious and inviting, and with a soundtrack of ranchera and banda music playing in the background, I'm almost transported back to MĂŠxico lindo y querido .